GRABBER Foot Warmers are thin, comfortable air-activated Warmers that fit in your shoe or boot, and provide over 5 hours of soothing warmth beneath your feet. The latest addition to the best-selling line of Grabber Warmers®, Foot Warmers contain a revolutionary air-activated warmer technology. Each individual package contains 2 Warmers. 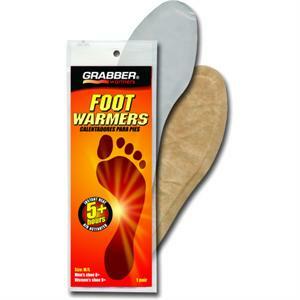 GRABBER Foot Warmers are a non-toxic, environmentally friendly, odorless heat source using all natural ingredients that are non-combustible. Click here to view more Grabber Warmer Products! Simply open the outer package and immediately place insoles any pair of closed-toe shoes or boots. Foot Warmers are specifically designed for use inside a shoe or boot where oxygen is restricted. Do not use in ventilated type footwear. For best results, insert each insole forward to toe of shoe or boot. No trimming. No peeling. Fabric side up, white side down. Children, the elderly, the handicapped and those unable to remove Foot Warmer by themselves should be supervised when using this product. Persons with diabetes, poor circulation, nerve damage or paralysis should not use except as directed by a physician. Remove Foot Warmer immediately if it becomes uncomfortably hot. If used incorrectly, higher temperatures may occur, causing burns. This product is not designed to withstand the impact of running or jogging. INGREDIENTS: Iron powder, water, activated carbon, cellulose and salt.